One of a kind – Enviro-Save Engine & Powertrain Protection Metal Treatment – Use it Once & Save Money 4 Life! Enviro-Save has more variety of indisputable performance results than any other product. Click on “Test Results” for Ford Motor, BC Institute of Technology, BC Transit, Indiana Police & many more, there are test results for everyone. Enviro-Save reduces fuel consumption by cleaning and restoring fuel injector performance, and by significantly reducing wear, friction and drag in all engines, transmissions, differentials, power-steering and all other component configurations. 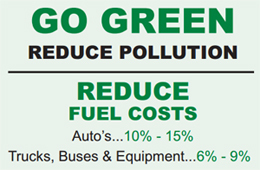 Enviro-Save customers who use our Powertrain Protection Kit normally report the following fuel savings: Automobiles 10% to 15% and Commercial Trucks, Buses, HD Equipment & Farm Equipment 6% to 9%, and higher figures are common. Fuel is consumed to overcome friction/drag, so when you reduce friction/drag you save fuel. Friction causes wear and oil sample analysis always confirms wear has been reduced, less wear and less friction equals longer life, less fuel and this is all accomplished with ONE treatment of Enviro-Save. All Enviro-Save products are thoroughly researched and technically formulated to provide the safest and most beneficial treatment for every component being treated. Lubrication Engineers, a Tribologist, Mechanical Engineers, engine rebuilders and veteran mechanics were engaged to produce Enviro-Save Metal Treatment so there are no risks when using it. There are products for virtually anything that moves and Enviro-Save Powertrain Protection Kits are available for any type or combination of vehicle or equipment. The product is very easy to use and each kit comes with instructions and application hoses. Would you like to have more horse power & increase normal vehicle life by 2 or 3 times? A One Time Investment & Application of Enviro-Save normally provides all of the above benefits by reducing friction, drag & metal bearing surface wear. Ford Motor test confirmed 5.28% increase in horse power, 21.8 more foot pounds of torque and many other benefits. Enviro-Save impregnates all friction bearing surfaces with micro resin, which makes them smoother permanently. Before and after treatment scientific oil sample analysis reports support Enviro-Save performance claims.